Week 6 Reading Comprehension (D-6). 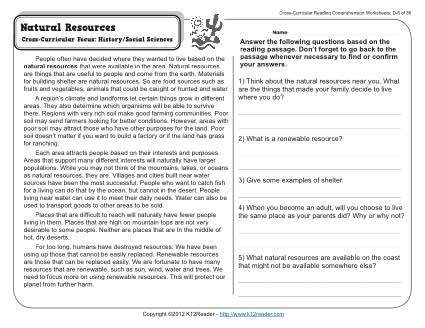 Passage and questions about renewable and non-renewable natural resources. Cross-Curricular Focus: History / Social Sciences. This worksheet is in line with Common Core Standards for 4th and 5th grade Key Ideas and Details, but may also be used for other grades. The passage’s Lexile Level is 880.